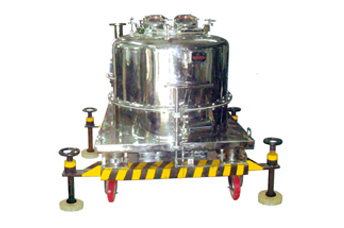 We are providing Four Point Suspended Centrifuge as per the requirements of the customers. The machine is designed as per the international specifications and standards, using the premium grade raw material. This fully automatic Four Point Suspended Centrifuge is supported by vibration isolating dampers and inertia platform, for excellent and smooth operations. The machine has special snap type arrangement for easy replacement. Also, it is provided with feed distribution cone for uniform formation of cake. Our machines are available from 12" dia. to 36" dia. giving a cake load of 170/200 kgs per batch max. Manual dome opening available upto 24" dia.